Men and women are invited to a YU Torah MiTzion Beit Midrash Zichron Dov Family Day Yarchei Kallah on Monday February 18, at Yeshivat Or Chaim. This year, the Yarchei Kallah programs have the theme of Marriage, as our Beit Midrash is learning Kiddushin. This particular Yarchei Kallah looks at A Prenuptial Agremeent Like No Other: The Tripartite Agreement. 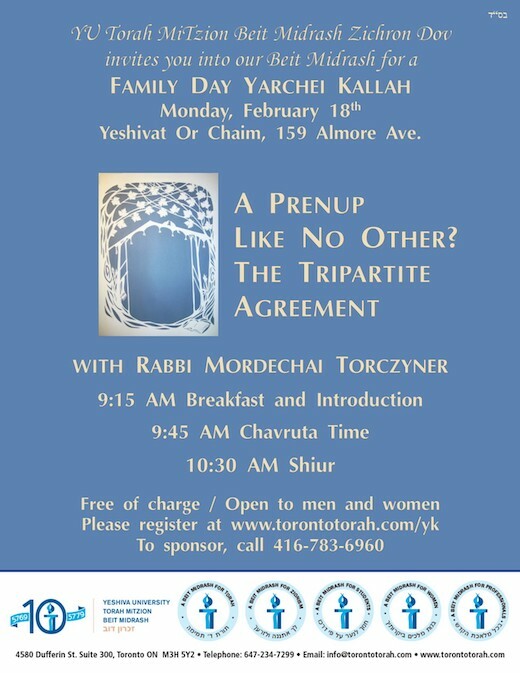 Visit www.torontotorah.com/yk for more information.